English: THE IDOLM@STER CINDERELLA GIRLS: Anytime, Anywhere with Cinderella. Other: THE iDOLM@STER Cinderella Girls: Starlight Stage - Shinshun! Happy New Year Campaign, Spice Paradise: Curry Meshi Ver. While it's not necessary to know all of them, it really helps make the show more enjoyable if you're familiarised with the idols here. The art quality is on par with the rest of the series for the most part, things look fine but it probably gets a little iffy trying to animate 14 girls all reacting to something, so the quality tends to drop when more of them are on screen. There's a bunch of sakuga cuts here and there and the movie trailer also has some wicked good cuts. Seriously though that one scene where Uzuki takes down three guys is great, thank you Megumi Kouno. The only complaint is that the fight scenes are a tease, while they look so good they just aren't long enough, then again they're just a part of a movie trailer but still. For characters there's mainly the Cinderella Project girls for this episode, with cameo appearances from Project Krone, the Totokira Gakuen group, Nana, Koume and Mizuki. TakeP is still the stoic shining star of this series. Everyone's on trope hyperdrive for this one, almost as if they're all trying to cram in as much of themselves as possible into this before saying goodbye for the time being. Overall it's a very fun and enjoyable send-off for the Cinderella Girls show, and the episode this series deserved. Do you remember Episode 15 of the original idolm@ster anime?...this special is pretty much that but with a Cinderella Girls coat all over it. For those not knowing what LA is going on about, this Cinderella Girls special is 28 minutes split into various vignettes of the Cinderella Girls Master girls with two other girls as cameos (those being Nina Ichihara voiced by ''Misaki Kuno'' and Koume Shirasaka voiced by ''Chiyo Ousaki'') going about their daily lives as idols and just some one-off moments here and there. LA will get straight to it, if you wanted the more comedic moments with the Cinderella Girls away from all the "melodrama" of the first and second seasons, then this special is a definite watch. The comedic moments although predictable can actually give most of the huge cast of the Cinderella Girls a bit more depth in their characters outside their stereotypical "likes" or "tropes that made their character", with the New Generation Girls getting the most screentime now that LA thinks on it. In terms of animation, the backgrounds are pretty much the best thing about the animation, the character design animation goes from being very detailed (see Anya's eyes) to janky (see Uzuki's face), it's overall inconsistent and can be a bit annoying as it clashes A LOT with the beautiful backgrounds. 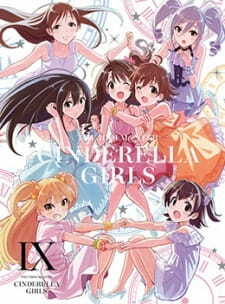 LA wished that this special would be between the first and second season (as in release date) as it fits in quite well much like the original idolm@ster anime series (having a relaxing time with the girls away from and before all the drama happens), but The iDOLM@STER Cinderella Girls: Anytime, Anywhere with Cinderella as a whole is a pleasant comedic bout with the Cinderella Girls where hilarity will ensue to some rather good effect.